The strength of an entire structure resides partially in the correct choice of the size of its individual supporting members. Beams are horizontal support members. Designing a beam is tricky because it will be subject to different types of failure. 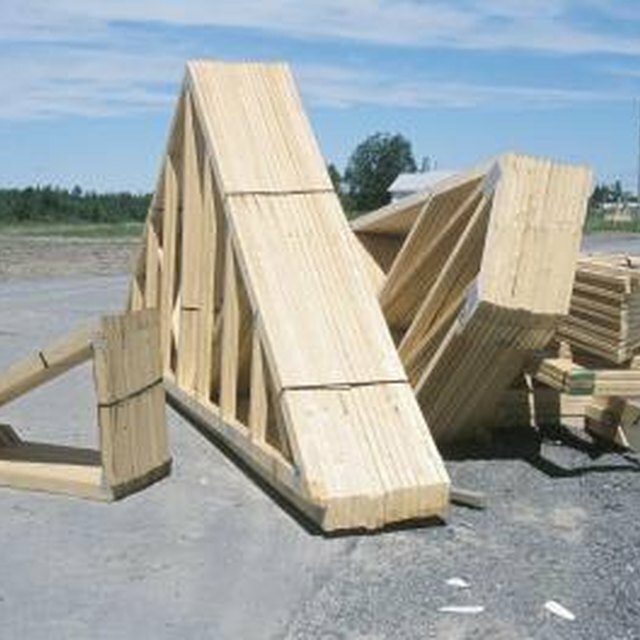 In the case of a wooden beam, there is the potential for fiber failure, excessive bending, and shear failure. Mathematical formulas have been developed to compute the amount of stress that would cause failure in a beam of any given size and material. Using design tables generated through computer models eliminates the need to perform complicated math and reduces, but does not eliminate, the capacity for human error in calculating beam failure. Understanding the amount of stress a beam can endure involves some calculation. Find the beam design table for the type of material you will be using. If home construction is your goal, you will likely be choosing a beam made of wood. A design table will exist for the type of wood you are using, such as fir or oak. Beams are subject to different types of loads, and determining the type of load distributed over a beam will affect the distribution of the load. For example, a point load indicates a load that is concentrated in one part of a beam. Point load is at its greatest at the middle of a span, where deflection is also greatest. A uniform load means that the load will be evenly distributed over the entire length of the beam. Design tables are typically computed for different types of load. Design tables are organized along two axes. The columns may have values that correspond to beam depth, and the rows may have values based on span length. The table output value corresponding to a given span length and beam depth will represent the load per inch of beam width possible for that material. Multiply the output value from the design table by the width of the beam in question. This value represents the toal load in pounds of force that may be safely resisted by a given beam of a given size. After designing your structure, hire an engineer to double check your calculations and structure design. Design tables and formulas can be useful to create a sense of how large a member will be required for a given purpose, but the number of forces acting on a given beam in a complex arrangement, such as occurs in a house, may obviate the accuracy of design table analysis. Charles W. St.Clair has been writing professionally since 2003. He lives in Oakland, Calif., working as an electrician and carpenter. St. Clair holds a bachelor's degree in public policy from Emory & Henry College and a master's degree in city planning from University of North Carolina-Chapel Hill, where he specialized in food system planning. What Is the Maximum Distance Between Beams & Deck Building?